Do You Have A Sealcoating or Crack Repair Project We Can Help With? Choosing Black Pearl Sealcoating, Inc. of northern Illinois assures the highest quality service and customer satisfaction! We’re an established family-owned and operated local business providing the industry standard in sealcoating products and application – and we guarantee coordination and clear communication with our customers at each project we do. Parking lots and driveways for restaurants, shopping plazas, shops, offices, community centers, churches, schools, government facilities and more. When cracks start to appear on an asphalt surface it looks unappealing – but that’s not the sole reason asphalt cracks are a problem that calls for a fast solution. Cracks also diminish the general strength of your parking lot or driveway, which can lead to significant structural concerns and expenses over time. Whether applying a fresh coat to the existing lines on your commercial parking lot or doing a total redesign of your parking lot traffic flow, we can help! 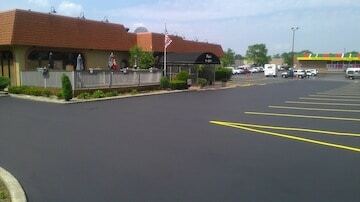 Black Pearl Sealcoating presents a full range of customized asphalt markings and parking lot striping solutions that will keep your paved surfaces safe and looking good! By filling in surface gaps, sealcoating reduces your driveway’s exposure to oxygen and sunlight while also limiting how deep oil or gas can seep downwards into the foundational. Looking to save big money over the long term from premature asphalt replacement? 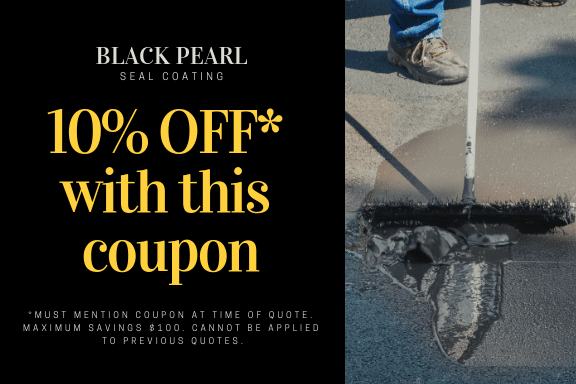 Sealcoating by Black Pearl helps to sustain and beautify your investment while safeguarding it from wear and deterioration that can result from harsh Midwestern weather conditions. At Black Pearl Sealcoating, our team doesn’t use sprayers. Instead, we apply our sealer by brush – it’s a better choice for application because a brush simply leaves a thicker, more durable bead of sealer over asphalt surfaces. 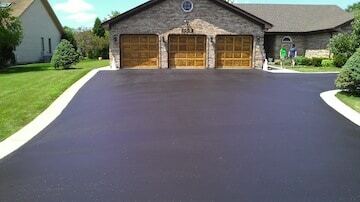 Brushing not only enhances the look of a driveway, it also offers better protection than a spray application. Because there are no two projects alike, we don’t conduct business based on estimates made over the phone – our commitment is to prolong the useful lifespan of your driveway or parking lot and save you the need for expensive resurfacing. Black Pearl provides a wide assortment of residential asphalt solutions including: asphalt patching, crack filler and sealcoating. 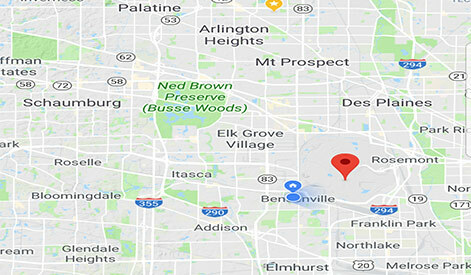 We’re proud of our well-earned reputation for providing our residential customers throughout the northwestern and western suburbs with quality services. We make it a point to communicate with all of our customers so they are informed and up-to-date on the status of the job site, and we provide helpful suggestions on the specific needs of their driveway or lot. Black Pearl performs seal coating and lot striping for a range of commercial lots: restaurants, shopping plazas, retailers, office facilities, churches, government facilities, sports or community facilities, schools and more. We also serve large multiple-unit condominiums and townhome associations too. Thank you, Joe, for the amazing job you did with our office building’s parking lot!!! 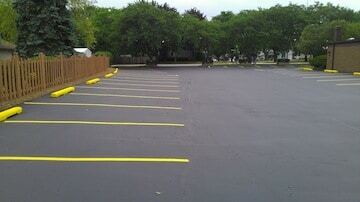 We had a local company sealcoat our lot the last few times and it looked like they applied watery paint. After the winter it was almost completely gone every time. I don’t know what’s in Black Pearl’s seal coat mixture but our lot has never looked so dark after the winter season. The coating Joe applied seems much thicker and made the lot look like new. Thanks again Joe for the great work!! Black Pearl Sealcoating is a family owned and operated business whose principals offer more than 20 years of experience in the sealcoating industry. Our service is always prompt and friendly, and our “trademark” is the precision and neatness in our work.